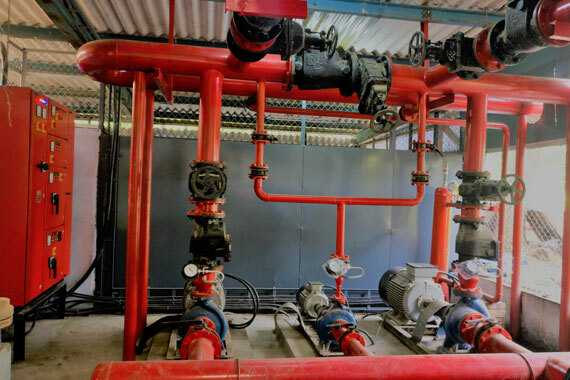 This is water-based fire extinguishing system, comprising of fire pumps, Stand by Pump, jockey pump, Hydrant Posts, Delivery Valves, Pressure Switches, Pressure Gauges, Control Valves, etc to deliver the required quantity of water at the hydrant at a given pressure. The users can attach a hose to the fire hydrant, and then open a hydrant valve to provide a powerful flow of water. Also, the users can attach this hose to a fire engine, which uses a powerful pump to boost the water pressure. Dry Riser is a vertical pipe with landing valves on every floor intended to distribute water to multiple levels of a building or structure as a component of fire suppression systems and could be charged with water as and when required. 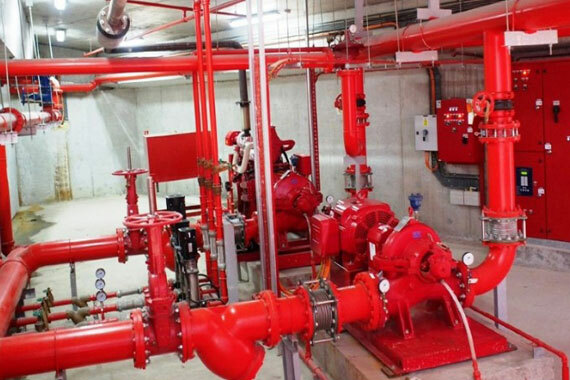 Wet Riser is a vertical pipe with landing valves on every floor intended to distribute water to multiple levels of building or structure as a component of fire suppression systems and are permanently charged with water through fire pumps to supply water for fire fighting purpose. 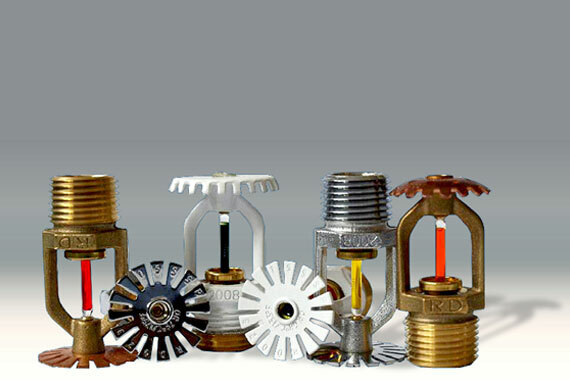 This is water based fire extinguishing system comprises of various types of sprinkler nozzles, pressure switches, pressure gauges, sprinkler alarm valve, etc which detect the fire at predetermined temperature and extinguishes fire automatically, giving an Alarm. 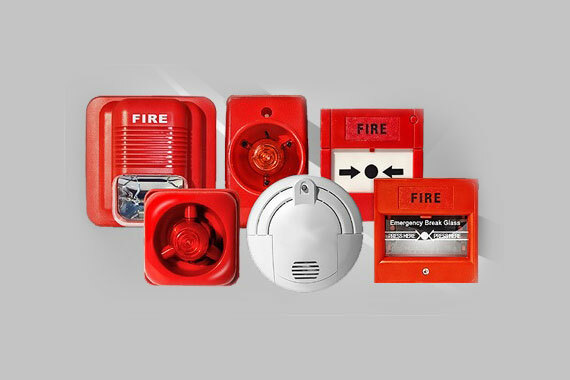 A fire alarm system has a number of devices working together to detect and warn people through visual and audio appliances when smoke, fire or other emergencies are present. These alarms may be activated automatically from smoke & heat detectors, or may also be activated via manual fire alarm activation devices such as manual call points or pull stations. Alarms can be either wall mounting sounders or horns. They can also be speaker strobes which sound an alarm, followed by a voice evacuation message which warns people inside the building. 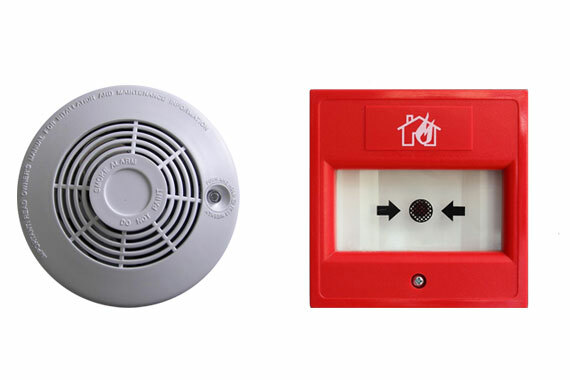 Fire alarm sounders can be set to certain frequencies and different tones. 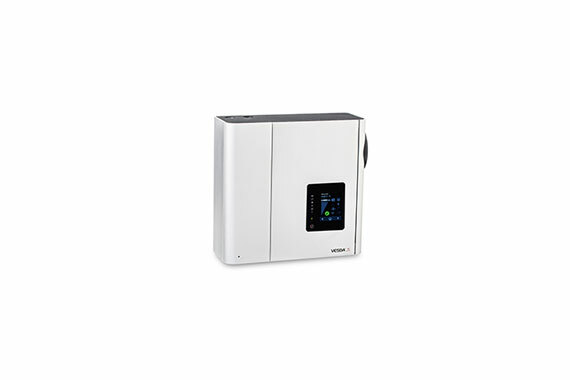 Analogue, Addressable Smoke Detection System individually identifies the addresses on a loop wiring. The control panel communicates with each device at various locations and in turn each device report back with an analogue value, based upon how much smoke or heat is present at that specific location. An Aspirating Smoke Detection System is active smoke detection system, consisting of a central detection unit which draws air through a network of pipes to detect smoke. The sampling chamber detects the presence of smoke particles suspended in air by detecting the light scattered by them in a chamber before it is visible to the naked eye. 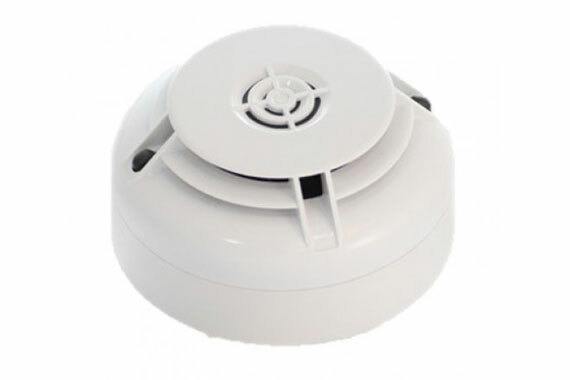 Conventional Smoke Detection System comprising of smoke detectors, manual call points and control panels which detects the smoke or a fire by zone, it could be multiple areas rather than specifying a specific location. 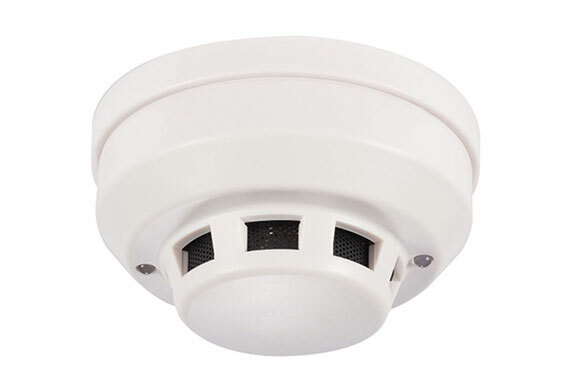 Fire alarm voice evacuation system uses speakers and amplifiers to notify occupants with an alarm tone followed by a voice instead of the traditional horn or bell. 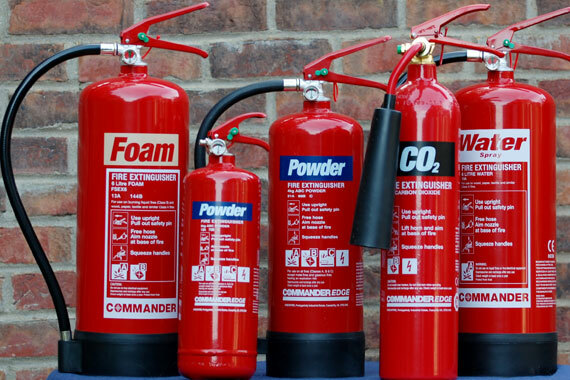 A fire extinguisher is an active fire protection device used to extinguish or control small fires. It is not intended for use on an out-of-control fire, such as one which has reached the ceiling, endangers the user or otherwise requires the expertise of a fire department. 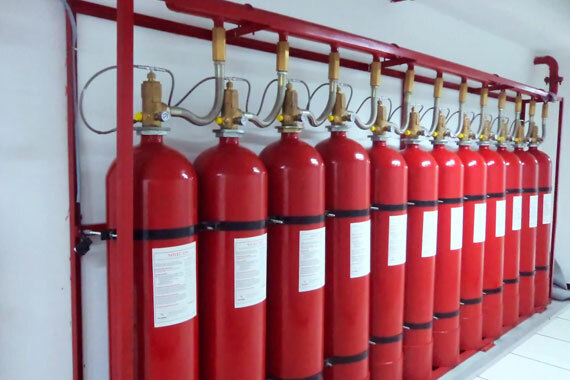 Typically, a fire extinguisher consists of a hand-held cylindrical pressure vessel containing an agent which can be discharged to extinguish a fire. 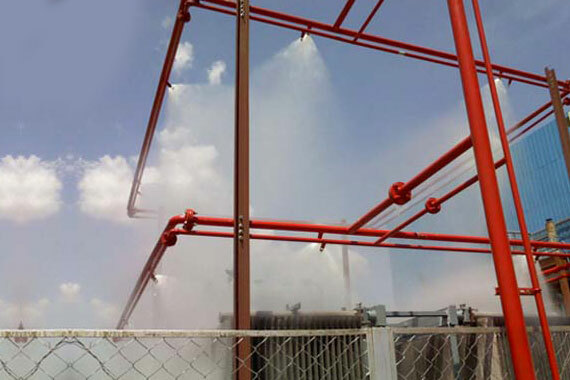 A water mist system is a fire protection system which uses very fine water sprays (i.e. water mist). The small water droplets allow the water mist to control, suppress or extinguish fires by cooling, displacing oxygen and attenuating radiant heat by the small droplets themselves. 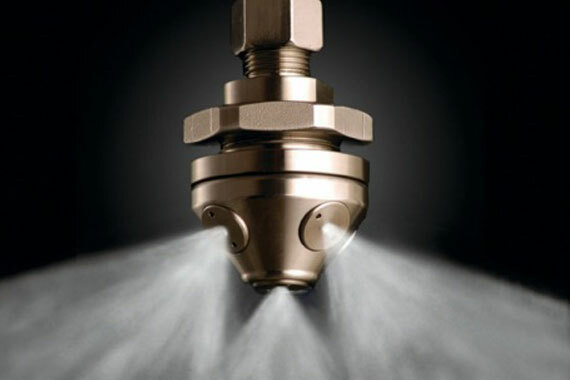 The effectiveness of a water mist system in fire suppression depends on its spray characteristics, which include the droplet size distribution, density and spray dynamics, with respect to the fire scenario, such as the shielding of the fuel, fire size and ventilation conditions. Medium velocity water spray system discharges water spray of finely divided droplets at medium velocity through water sprayer. This system is ideal for protecting hazards involving light oils where emulsification from high velocity sprayers is not possible. 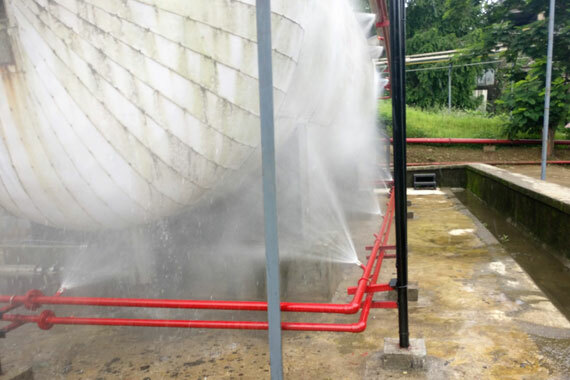 The fine spray has a high heat absorption rate so medium velocity sprayers are an effective method of protecting adjacent plant and structures from heat during a fire by providing a continuous cooling spray over the exposed surfaces. Keeping nearby equipment cool minimises damage and reduces the risk of explosion. The high velocity water spray system discharges a jet of water at high speed through the nozzles. The water jet forms a cone of coarse spray of uniform density which is discharged over a defined area. The coarse spray is able to penetrate the flame zone and reach the surface of the burning oil. The turbulence created by the high velocity spray forms an oil-in-water emulsion on the surface of the oil that will not burn. High velocity systems are often used to protect equipment that incorporate heavy or medium oil equipment such as transformers, circuit breakers, diesel engines and fuel oil storage tanks, turbo-alternator lube oil systems and oil-fired boilers. Gaseous fire suppression is a term to describe the use of inert gases and chemical agents to extinguish a fire. Also called clean agent fire suppression. The Gas Suppression system typically consists of the agent, agent storage containers, agent release valves, fire detection and control system (wiring control panel, actuation alarming), agent delivery piping, and agent dispersion nozzles. The agent may be delivered by means of solid propellant gas generators that produce inert gas.